My husband and I were invited by Gugglburger family of Vienna to visit us in Austin in the spring of 1998. Eva, the wife, gave me a gift of a book on Sissi by Brigitte Hamann. It was a short profile on a very dynamic woman that led the astrologer in me to ask what were the power characteristics in this woman’s horoscope? What were the turning points in her life that shaped this woman that many in Austria still love and remember? There are three key components of major personality points in Sissi’s chart that can explain part of her character. 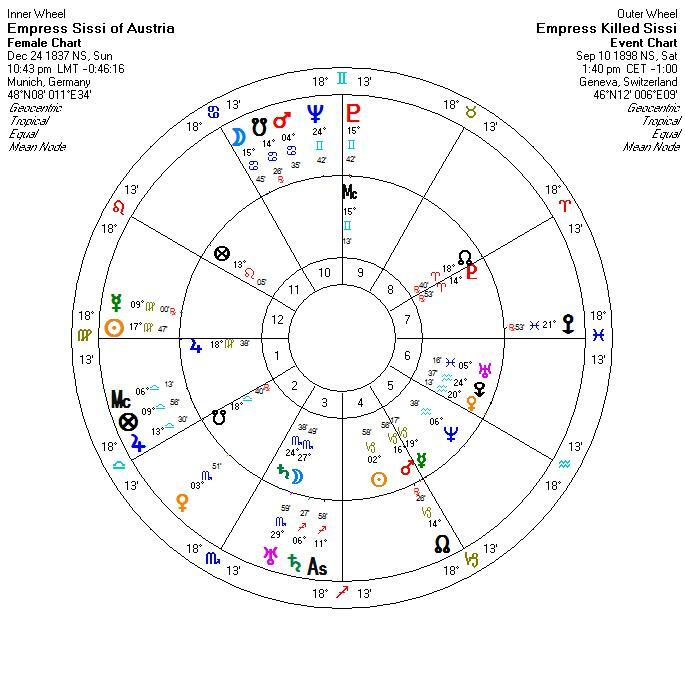 Although she was born with her sunsign in early Capricorn on December 24, 1837 at 10:43 p.m. in Munich Germany (data from the Imperial Palace staff) she had 18 Virgo on the Ascendant with Jupiter there too and trined by Mars. This is usually a person that can be athletic and sporty but also one that knows the rules of etiquette, meticulous in detail, fashion conscious and needs to achieve perfection. Sissi’s sports and athletic ability is strengthen by the trine of Mars to Jupiter. Her Virgo ascendant is associated with fashion and dress. I would guess that appearance and her fashion tastes were of extreme importance to her. It was noted that she spent three hours a day on her hair alone and hid her face in public from staring glances of strangers that wanted to catch a glimpse of her beauty . In her older years she became a narcissist. Constantly obsessed with her appearance. It was just the only way she had learned in her culture that women were most valued and admired for their appearance. If she had lived in this century, she would have had more outlets for her ambitions. One of her few options was to use her beauty for power and fame. After she left the Viennese court, she discovered her effect on others and fully bloomed into a self-directed woman. In this century the separation and divorce of Prince Charles and Princess Diana parallel Sissi and Franz Joseph except that Diana was allowed to divorce. However, Diana did not have the willpower and drive that Sissi possessed, but she had beauty and a generous heart. Generally, Aries-Pluto people enjoy risk taking, gambling, competitive sports and horse racing. Sissi had a triple dose of these Aries-Pluto attributes in her chart. Her position limited her choices in ‘proper’ society, but she did fully express out her competitiveness with horseback riding and hunts. She not only had to be excellent at the sport, she drove herself to be the best in all of Europe. No other woman could eclipse her. She had to be the best and number one. This is the point in her chart where infidelity was intolerable to her. To have her husband wanting other women when she felt she had so much to give made it impossible to live with him. Sissi’s driving self control, will power and determination is seen with Mars (almost an Out of Bounds Mars) and Mercury (was Out of Bounds) in Capricorn squared by Pluto in Aries. This powerful square was also aligned with the lunar nodes. This is an extreme position of personal strength because at that time Pluto was in its own rulership sign of Aries and squaring its own planetary node at 17 Capricorn. To have Mars and Mercury in extreme declination just added to the exceptionalism of her habits and believes. People born during this period became the great industrialists, empire builders and pioneers in the USA. These were the people who explored Africa and expanded their empires. They had the ability to carve out their own path, pioneer unknown territory and build a future based on risk taking. Sissi had these qualities in spades. If she had been born a man, she would have achieved much. For her time, she was a pioneer of independence. She couldn’t divorce her husband for infidelity but she left him all the same. Austrian society was scandalized by her actions. These qualities would have been seen much earlier if she hadn’t been so young when she married and was intimidated by royal society. She fell in love with Hungry and eventually got Franz Joseph and Austria to merge Hungry into the empire. This was quite an accomplishment for a woman in her times. There is a quality about Sissi’s life and personality that reminds me of Madonna, the rock and roll singer. Madonna has Virgo rising with Pluto on her Ascendant. She uses fashion and style combined with a burning ambition to rise out of the unknown to be the first top-of-the-music-world woman singer to completely control and manage her own career. She molds and shapes her body and face with iron willpower and athletic ability. In the late 1970’s every young girl in the USA dressed like her. It was Madonna who started to wear underwear on the outside as clothing. Sissi and Madonna have a similar Virgo-Aries-Pluto combination in their charts. Franz Joseph was born on August 18, 1830 at 9:45 p.m. in Vienna. His had a Leo Sun and it was conjunct the Moon and Saturn. These are a very strong planetary positions for a leader of a country. I would think that he was well loved by his people and had a big generous spirit. He needed self expression but it was well tempered with stability and adherence to the requirements of the job. Duty and responsibility was ingrained in him. With Taurus rising, he had a love for the land and was a carefully considered person that was difficult to move or alter his beliefs by others. Stubborn was his middle name. He like to be with friends and lovers that captured his imagination. Artistic women would have been attractive to him. 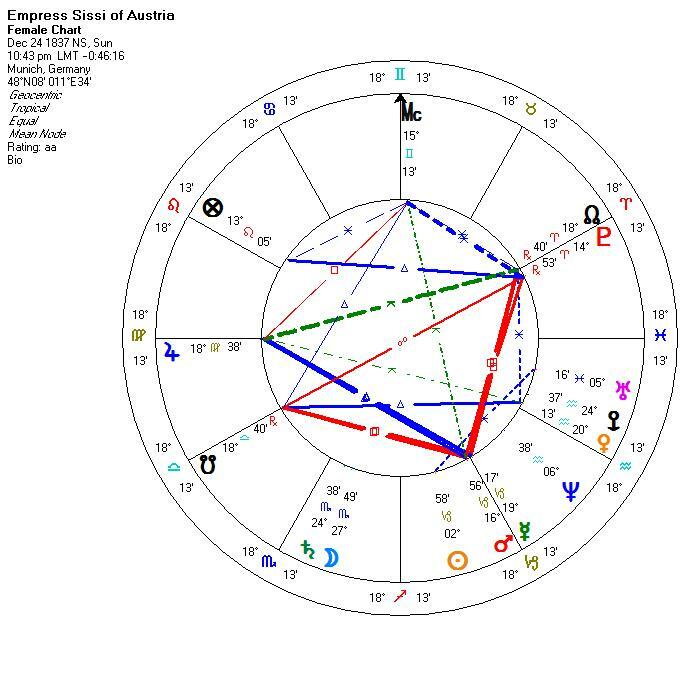 What captured his heart was that this aspect in his chart fell on Sissi’s Mars. He was very attracted to her sexually and she captured his imagination. There was electricity between them. Their sexual attraction was magnified by his Mars squaring her Sun. This is a sexual aspect too but it is accompanied by anger and frustration. 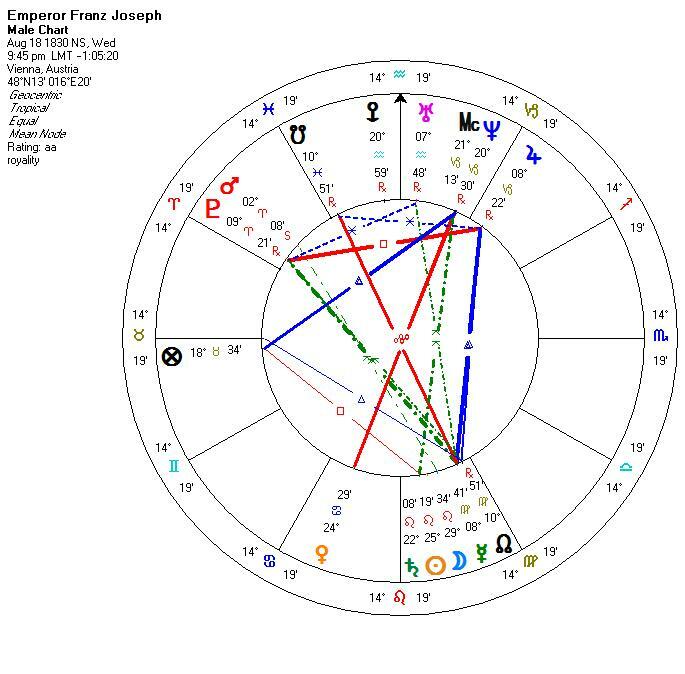 This was complicated by Sissi’s Moon conjunct Saturn square Franz Joseph’s Saturn, Sun and Moon in Leo. Sissi had difficulty having emotional empathy for him. She resisted him and frustrated him. She had conflicts with older women, like her mother-in-law. His duties and responsibilities didn’t leave any room for nurturing her. So, the attraction was present but there was much that frustrated and pulled them apart. From the very beginning of their marriage, his duties took him away from her and Sissi was left with her mother-in-law and the royal court. Her resentments started soon after her arrival. On August 15, 1853 the Emperor Franz Joseph met Sissi for the first time when she was just 15. It had been arranged that he would marry her older sister but upon seeing Sissi, he would have no other. At the time of their meeting, Franz Joseph was going through a period of great personal change. The choice of Sissi was another expression of his independence. At the same time this period indicates a transiting Saturn conflict with his Moon which represent his mother and other women in his life. I would guess that his mother and family would have resisted his choice in Sissi. He may have had to make agreements with his family about her in order to marry her. Perhaps that is why so much influence was given to his mother regarding Sissi. She was married against her will to Franz Joseph which might have contributed to her future resentment. She wasn’t asked but told to marry him. Perhaps if her feelings had been considered, their relationship could have matured more. The mutual attraction for each other was naturally there between them. Hamann states: “Her marital relationship however, in these first years, was quite good and the young couple were genuinely drawn to each other.” The difficulty was with Archduchess Sophie who ruled Sissi and her grandchildren’s upbringing. Sissi was displaced as a mother to her own children by Sophie. In October 1860, Sissi left Vienna and Franz Joseph for good. It was a period of time for her when she had a great need to redefine her career choices with transiting Uranus on her Midheaven. As limited as her choices were, she was ready to rebel and change her life. She couldn’t stand the habits and routines of Viennese court with transiting Saturn opposing her Uranus. Most Aries-Pluto types are very future oriented, love children and demand loyalty from their family and friends. If they feel that they have been dishonored, they will reject those people and never look back. They can disown their own children dispite their deep caring for their offspring. With Sissi’s separation from Franz Joseph, she never looked back and she gave up her claim to her children except for her youngest daughter Marie Valerie. Hamann said “She concentrated exclusively, in a positively hysterical manner, on the joys and sorrows of her ‘only child’, her ‘Hungarian daughter’.” I believe she loved all her children deeply but she was unwilling to play the political price it required of her to see them and be with her other children, so she turned away from the pain and concentrated on Marie Valerie. It was from this depth of feelings that the great mourning period of her life began after the suicide of Rudolf, her only son and heir to the throne on January 30, 1889. Transiting Pluto and Neptune was opposing Sissi’s Saturn-Moon in Scorpio. Pluto is associated with death and children and Neptune is associated with depression, illusion, fantasy and habit forming drugs. This was a tough three year transit that could easily stress most people. But the loss of her son and the marriage (she was against it) of her youngest daughter was very deep for Sissi. She kept most people at an emotional distance from her generally but this loss widened the gap. She was 52 and her beauty had faded and her children were gone. She lacked purpose so she floated into a world of her own illusion to stop the passage of time. Hamann said “Elisabeth’s subsequent despair was partly an expression of her guilty conscience for taking so little notice of her son. She never recovered from Rudolf’s death.” These aspects on her Moon also represented effects on the body and emotions. Hamann said “The infirmities of old age came to her early, as a result of excessive exercise, starvation diets, and chills caught on long daily walks in all winds and weathers. Elisabeth, the Empress of everyone’s dreams, now had sever rheumatism, strained nerves, a troubled mind…” Her iron will and need for perfection led to her extremes of diet to maintain her looks with that triple Aries-Pluto aspect. It’s in later years that obsessive, driven behavior shows its results with the long slow transits of Pluto and Neptune to the Moon. Much of this could have been avoided if she had found a greater purpose to put her energies into but society didn’t give her many choices. Like Princess Diana, she struggled to find a role for herself that would fit her position and not embarrass her family. Charity work by royals was not acceptable yet. On September 10, 1898, approximately 1:40 p.m. in Geneva, Sissi was assassinated by a lone man looking to make a name for himself. She wasn’t his intended victim but she was at the right place at the right time so he made do. The main aspect of the day was the transiting Sun squaring Pluto. This can promote extreme actions by younger people especially males. Both the transiting Sun and Pluto were aspecting her Midheaven which points to her prominence as a public person. 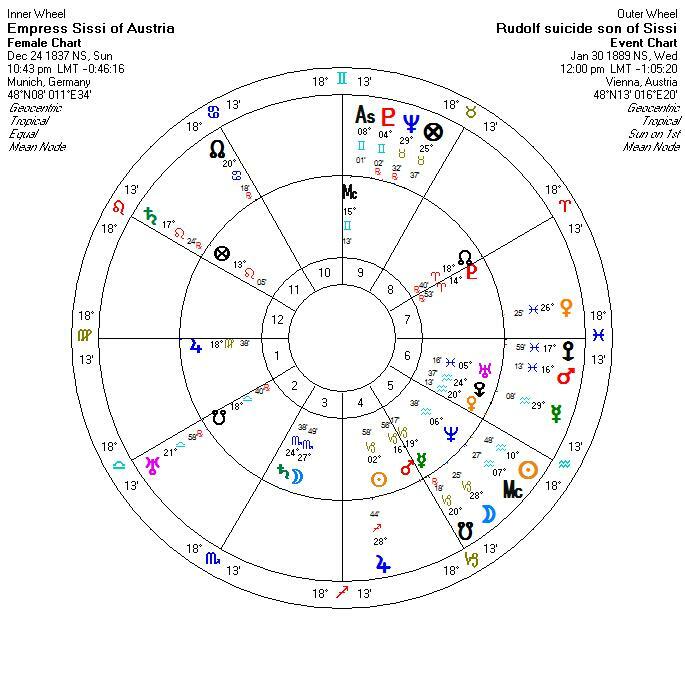 Even the hour of the assassination put the event’s Ascendant on Sissi’s fourth house cusp which is associated with the end-of-life but more importantly it re-emphasized the Pluto square Sun aspect for the hour involving third parties, surprise action and the unexpected. Transiting Mars was opposing Sissi’s Sun which can bring accidental events into one’s life which is probably why she was singled out. The fact that she was a frail old famous woman who could be easily attacked made her a target. The transiting Moon opposed Sissi’s Mars which can attract violence to her person. She was stabbed with a knife but managed to walk to a boat and board it. It was over an hour after the attack before others realized how serious were her injuries. Her iron will and pride prevented her from fully telling others how badly she was hurt. She died that day.